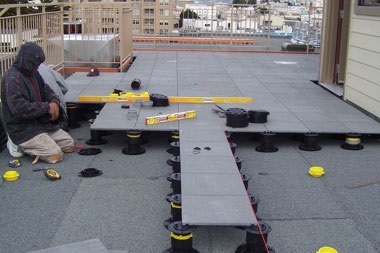 StoneDeck can be easily installed on rooftops or framed joists that are 16 inches on center. 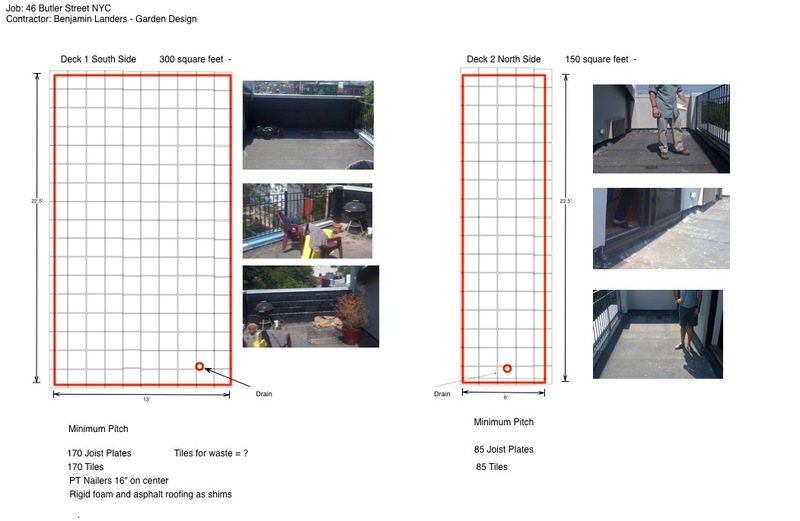 StoneDeck can be installed by carpenters, deck or dock builders, and landscape contractors. A handy homeowner can also install the system. 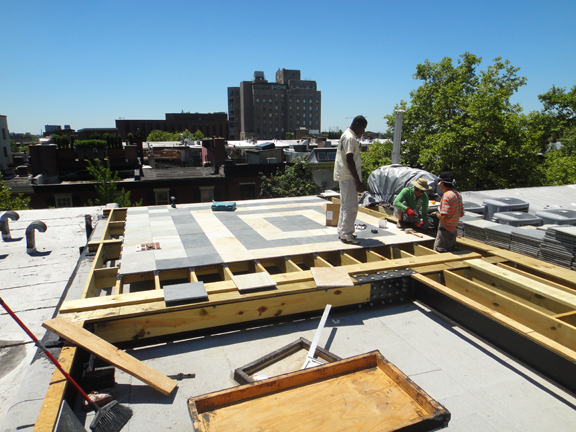 StoneDeck installation over standard framing is made possible using joist plates. For information on how to install StoneDeck over joist frames read the StoneDeck joist installation details below or view the video at the bottom. 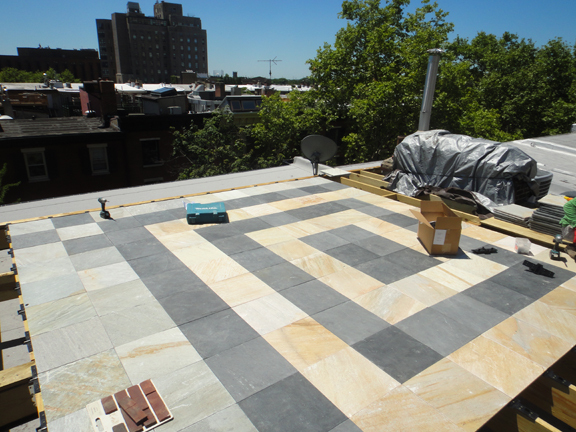 When installing StoneDeck, first spend a little time considering layout possibilities. Make sure the deck is framed 16” on center. Staggered solid blocking is necessary if the joist span is greater than seven feet. Solid blocking should be installed at 4 to 5 foot interval spacing. Check the deck frame for squareness, plane down any crowns and shim where joist sags are unavoidable. Typically one would place the first row of StoneDeck down on the outside edge and work back towards the house. This will assure a full tile at the outside edge and eliminate a cut. There are, however, many deck configurations that may result in starting in the middle or at the house. Frame deck 16 inches on center. Install solid blocking every 5 feet. Check that framing is square using 345 method by running string lines down center joist and along the front edge of first stone course. Screw down a joist plate for the first course using the string line as a guide (16” off of rim joist). Space the joist plate on the rest of the joist working from the center joist toward the outside edges. (Spacing is 16 inches on center). Use PL400 to glue down first row following string line. Tap joist into the groove in the backing aligning spacers tight to the stone. Screw the joist plate into the joist using the center hole in the spline and two more screws in two opposing holes. 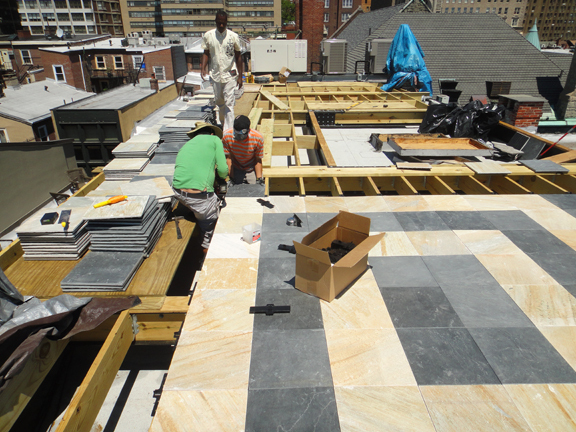 Using a no-mar-rubber mallet, tap next row of panels into place and repeat steps 6 and 7 until surface is complete. 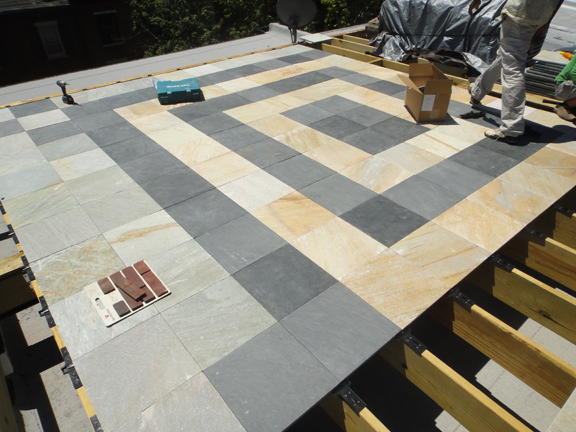 Seal deck with a stone sealer. 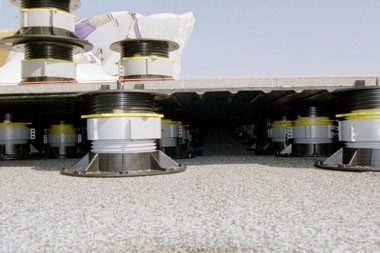 When installing along the edge, if the flying spline doesn’t engage with the groove on the StoneDeck panel or there isn’t a spline on that piece apply an exterior construction adhesive on the surface of the joist plate to secure the StoneDeck panel to the joist plate. It is important to run sting lines in both directions of the deck to insure a straight line and proper StoneDeck placement. 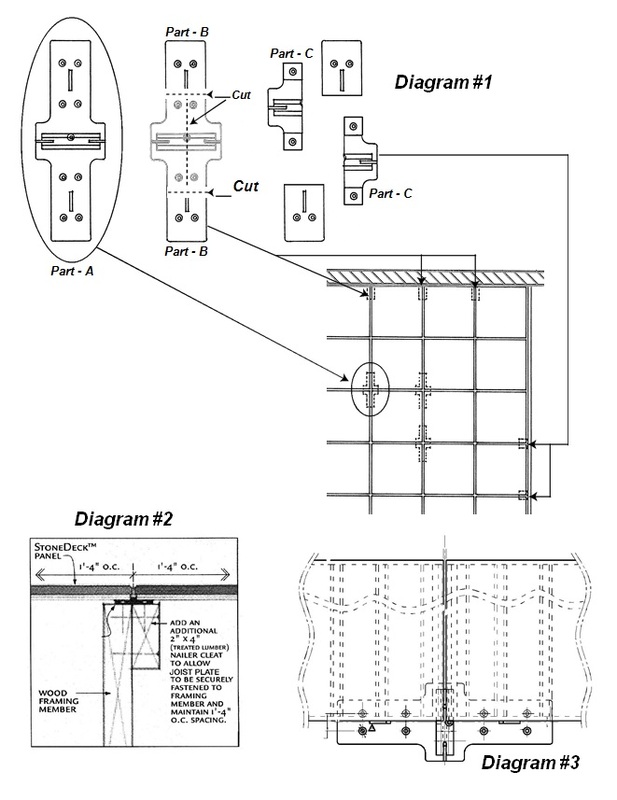 The joist plate has built in spacing tabs that are designed to give the minimum spacing required. Additional spacing may be necessary to achieve proper 16” on center spacing. If you have started on the outside and have worked back toward the house you may have a situation where you need to place a cut StoneDeck panel. Place joist plate part “B” up close to the house. Take exterior construction adhesive and apply generously to the topside of joist plate part “B”. 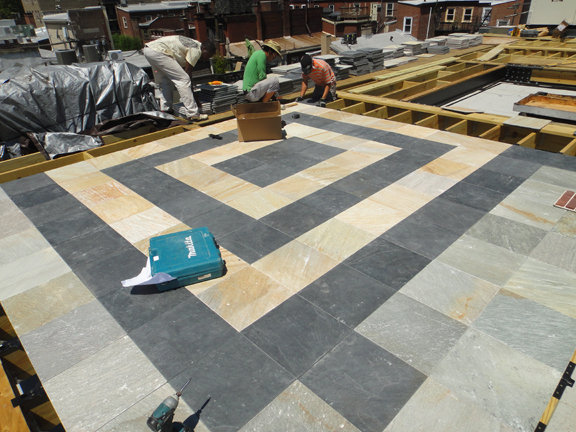 Take the StoneDeck panel and starting at about a 45-degree angle slide the panel with the grooved end into the flying spline from the previous row and slowly drop into place. Weight should be applied to the top surface of the cut StoneDeck panel to make full contact with the construction adhesive. If you have any questions review the StoneDeck frequently asked questions. If you need more information please use our contact form.